Little Common Football Club went past the 100-goal mark for the season during another wonderful week. Table-topping Common won 5-0 away to Steyning Town in Macron Store Southern Combination League Division One on Saturday and 3-1 at Storrington in round two of the Division One Challenge Cup on Tuesday, taking their goal tally to 103 in all competitions. Common player-manager Russell Eldridge said: “We’re going well and we’re happy with where we’re at. We demand more from ourselves as individuals, which makes us better as a unit. Eldridge’s side has opened up a 10-point lead at the top of the table having won 22 of its 26 league matches to date. Second-placed Langney Wanderers have two games in hand. Common have won more matches than anybody else in the division, possess the best goal difference (+63), are the highest scorers (89 league goals) and have the meanest defence (26 goals conceded). The victory over Steyning was the fifth time Common have won 5-0 this season and the eighth time they’ve scored five or more goals in a game. One of those occasions was a 6-1 victory at home to Oakwood in October and Common will travel to Crawley for the reverse fixture tomorrow (Saturday). “We go there looking to come away better than the position we’re in,” continued Eldridge. “It’s a nice ground to play at, always a nice surface and we’re looking forward to that. “I know their manager very well, he’s someone I get on really well with and his teams are always tough, but it’s about us and the way we do things. “We can’t expect any favours from anyone else and we know most teams have got nothing to lose against us. We have to make sure everything we do is to the best of our ability and if we do that, we’ll have every chance. Lewis Parsons is unavailable, but Common should otherwise be close to full strength. 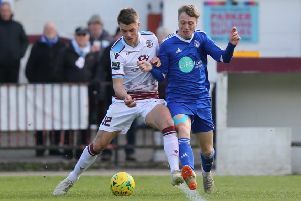 Bexhill United are seventh in the same division, but would’ve gone fourth had they won either of the two home games they’ve lost over the past week. Bexhill will travel to third-placed Lingfield tomorrow eager to improve on a 3-0 defeat in October’s reverse fixture. “I thought that was one of our worst performances here against them,” continued Light. “I was a little bit embarrassed sitting amongst the supporters because I thought we were awful on the day. Lewis McGuigan hobbled off against Hailsham Town on Wednesday after taking a stamp on his calf, but will hope to be fit by tomorrow.